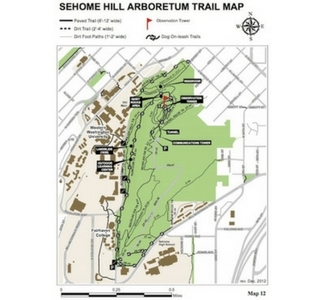 The Sehome Hill Arboretum is a forested hill in Bellingham, Washington, devoted to educational, aesthetic, recreational and research purposes. It is a 180-acre park of second growth forest, located adjacent to the campus of Western Washington University. Though called an arboretum, the hilly expanse atop Sehome is not consciously planted as an exhibit of tree species, but naturally wooded and rich in the plant species (both native and nonnative) typical of the region. The arboretum is jointly managed by both the university and the city.